The Waveney & Blyth Arts writing competition culminated in a poetry reading at the Ferini Art Gallery, host to the ‘Murder of Crows’ Art exhibition. Twenty people gathered to share a meal, view the exhibition and hear the three short-listed poems. From 70 entries it had been difficult to choose only three but finally we made our choice. They were three very different poems but all had impressed us with their technical ability, the images they created in our minds, and some of the phrases they had used. 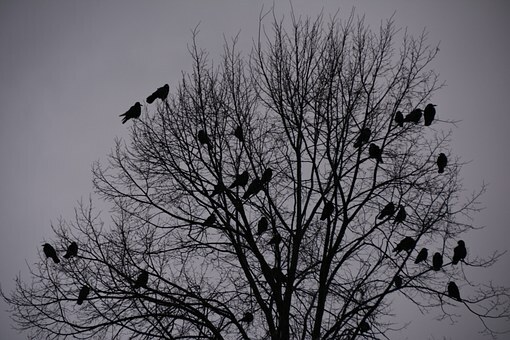 Rooks, crows and ravens were represented in the short list and writers drew inspiration from nature itself, from paintings and from literature. The winner was chosen by public vote and the result was very close but Rooks: Where the Yew Tree Shadows Fall by James Knox Whittet, just pipped the post. Thank you to everyone who entered and congratulations to our three short-listed poets and to James, our winner. Thanks must also go to Michaela Barber at the Ferini Art Gallery for hosting and curating the crows art exhibition, [The exhibition ends on 24 September] and for hosting the Arts & Eats lunch. Thanks also to Beth Soule, of Suffolk Poetry Society, who ran an inspirational writing workshop at the Gallery using and reflecting some of the works of art. We are almost at the end of our 2017 Celebrate programme but don’t forget our AGM on 21st October when we hope to showcase our Crow poems and artworks as we reflect on another successful year for Waveney & Blyth Arts and look forward to new events in 2018.
when the last rays from the low sun have gone. as watered light across the bare fields spread. and the sea loch mirrored the moonlight’s ring. when I can’t be awakened by your calls. How to Dance with Death. devours it for a living. with which to comfort you. pins it down under his kindly claws. from its grisly lumps and strands. Listen to the rattle of his shiny quills. He will mantle you with his satin feathers. a tear like a blackened pearl slides down. Crow will watch your back. At the time of mourning he dresses for a ball. with you, his chosen partner. Hungry for the forest’s treasure, burn, destroy, in equal measure. rays fall on her, innocently. Nevermore to ripen gently. beams primeval. Wings fold closer, body stiffens thinking of her. where she, like a mango forming, green and glossy, knew sun’s warming. hungry for the forest’s treasure, burns, destroys, in equal measure.